Estève is undoubtedly one of the leading representatives of the first generation of artists that included Bissière, Bazaine, Manessier, Singier and Le Moal and who, after the Second World War, chose non-figuration. Brought up in the countryside by his grandparents who were peasants, Estève retained from his childhood in the country memories that fed his work. In 1913, at the age of nine, he went to live with his parents in Paris: his father was a cobbler and his mother a dressmaker. A solitary visit to the Louvre had a decisive effect on the boy: he was fascinated by Corot, Delacroix, Chardin and Courbet, and above all by Paolo Uccello’s Bataille de San Romano, of which today he still has a reproduction in his studio. After the First World War, which he spent at Culan, he returned to Paris. His father, unsupportive of his wish to become an artist, found him a position as an apprentice to a furniture maker. Estève began to paint, showing evident talent. In 1923 he spent a year in Barcelona, designing fabrics and familiarising himself with Catalan art. On his return, despite the financial difficulties that were to plague him for many years, Estève devoted himself to his vocation. He attended the ‘free academies’ in Montparnasse (Colarossi at the Grande Chaumière), and above all trained himself by studying the artists whom he referred to as the ‘Primitifs’: Poussin, Fouquet and Cézanne. “Cézanne is the artist who has always comforted me. He makes me want to paint. He indicates the endless possibilities of evolution, gives confidence and opens up horizons; this is a permanent and fascinating encouragement. And what sincerity he has! Part of his greatness doubtless lies in the fact that it was impossible for him to cheat… Each of his gestures over the work is a response to an absolute need, profound, urgent and vital. A saint of painting” (Estève, Zodiaque, April, 1979). He painted landscapes, still lives, interiors and a few portraits in a naturalist style, influenced by the fauves, the pointillists and even the surrealists. Around 1929 he was influenced by the work of Fernand Léger, whose cubist style inspired him to give up the illusionism of traditional painting and explore a purely plastic and inventive path. This was the subject of Couple, with its graded planes that introduced arabesques onto a flat surface animated with bright colours. He participated for the first time at the Salon des Surindépendants, where he continued to show until 1938. His first exhibition was held in 1930 at the Galerie Yvangot and attracted the attention of Maurice Raynal, the historian of cubism. In 1933, in reaction to the earlier flat style, he painted forms and colours dominated by green and orchestrated by the play of shadow and light. Around 1935 we note the marked presence of lines in spirals against transparent backgrounds, with a preference for blues and reds. 1936 saw “a brief expressionist crisis”, a consequence of the Spanish Civil War, which brought back to him memories of Catalonia, and “the expressionism changed into hieratic primitivism” (Jean Leymarie, in his preface to the catalogue for the exhibition Estève, Grand Palais, Paris, 1986). In 1937 Robert Delaunay, who was responsible with his wife Sonia for the decoration of the aviation and railway pavilions at the Paris Universal Exhibition, requested Estève’s contribution. This was a period of intimate paintings that show a remarkable control of the summary of the composition in which figures and objects match each other. Just before the Second World War he found a studio in rue Lepic in Montmartre, and began to draw his subjects from domestic reality. In his painting Hommage à Cézanne (1942), a hymn to colour, he celebrated the still life. One of his works was included in the exhibition Hommage aux Anciens at the Galerie de Friedland, which also included works by Lapicque, Bazaine, Gischia, Tal Coat and Pignon. In the same year he took part in group exhibitions at the Galerie Berri-Raspail with Les étapes du nouvel art contemporain and at the Galerie Saint-Germain-des-Prés alongside artists Desnoyer, Latapie, Rouault and Villon. In 1943 he exhibited at the Galerie de France with the group Douze peintres d’aujourd’hui, and in Cinq peintres d’aujourd’hui with Borès, Beaudin, Gischia and Pignon. From 1941 to 1944 he took part in the Salon d’Automne. An exclusive contract with the Galerie Louis Carré (1942–1949) allowed Estève to work on his painting without financial constraints. Two influences predominated during this period: Roman painting, and in particular the work of Bonnard with its spectacle of light and colour; and landscapes, to which Estève returned after abandoning them since 1934, painting from memory or the imagination. He created a chromatic network of lines with a multitude of vibrant strokes. In 1945 he exhibited with Bazaine and Lapicque at the Galerie Carré (catalogue with an essay by Jean Lescure, Estève ou les chemins silencieux de la réalité). Then in 1948 the Galerie Carré held its first exhibition of the painter’s work: Trente peintures, 1935–1938, 1941–1947, showing his work again in 1965 with Vingt-quatre peintures, 1935–1947. Estève was now a respected member of the French contemporary school, and he began to have exhibitions abroad: in 1946 at the Stedelijk Museum at Amsterdam with Bazaine and Lapicque, then in 1947 the same group was welcomed at Copenhagen and at Stockholm (where he had already exhibited in 1937, invited by the Franco-Swedish gallery on the advice of Braque, alongside the latter as well as Picasso, Léger, Gris and Matisse). Scandinavian interest in Estève’s work dates from this period, and he had regular solo and group exhibitions in the region: we should mention his solo exhibitions in Copenhagen, Statens Museum for Kunst in 1956; in Stockholm, Svensk-Franska Konstgalleriet in 1956; in Copenhagen, Statens Museum for Kunst, with 159 paintings and a catalogue by L. Rostrop Boyesen, in 1961; in Oslo, Kunstnernes, with 150 paintings and a catalogue by A.J. Aas and R. Revold, in 1961. Between 1947 and 1950 he returned to painting the human figure with the admirable series Métiers. In this cycle, Estève emphasised the profound relationship between the artisan and his tool using a compartmentalised grid in which spirals and lines are arranged using a palette of bright colours that lend a dynamic dimension to the composition. He painted 20 paintings on the theme of Le peintre, Le sculpteur (1947 Donation Estève City of Bourges), Le photographe, Le souffleur de verre, Le tisserand (1948) and Le faucheur (1949). He said that he was a “manufacturer” of paintings and not an artist. “Trades fascinate me. It is in what is achieved by the hand that I find the greatest, the highest sources of wonder” (op. cit.). His paintings demonstrate increasing formal autonomy, and Hommage à Fouquet (1952 priv. coll.) appears in this context as a key work. With perfect control of the palette and abandoning all reference to the outside world, Estève creates his own world, moving towards pure painting and accepting its demands as his only priority. Without disowning the example of the masters, he thought that “painting’s roots in the past also work for its future,” and he wished “to discover an order derived from my nature” (op. cit.) and to be master of every aspect of his creation, to employ Poussin’s expression. Between 1952 and 1954 he tried out this new language in a series of paintings on the subject of the Middle Ages, with tournaments and emblems, popular feasts and legendary beasts: Trophée, Tournoi, Tarasque and Trouvère (priv. coll.). Other titles refer to the world of Islam, with its fables, colour and abstraction par excellence. In these paintings, coloured signs mingle with or confront each other in a perfect balance of forms and colours. Estève wrote about his method of working: “I never use a sketch, painting directly on the canvas, without a preparatory drawing. Colour and forms find their place… Each work is a series of transformations… In fact for me each work is an addition of endless repetitions that last until I find myself in front of an organism that I consider to be alive. Only my sensitivity can tell me whether or not I have attained this recognition… One of the things which characterises me the most is that I do not have any pre-imagined image; no form which I wish to obtain on the canvas. When I begin to paint, an exchange is put in motion, a conversation commences between myself and the painting as it becomes organised… No longer having nature in front of me, nor the recollection of it, I find myself in front of art, of a reality, an object which has grown and which is even more tyrannical than a subject, but at the same time more flexible, obstinate and open” (op. cit.). For Estève, time is a decisive factor. He speaks of the ‘conversation’ conducted with a work. He applies himself for an hour, then leaves the work, forgets it and finally returns to it again. The sessions are numerous, until the moment when “looking at the work I’ve done, I see that in it that something has been offered to me” (op. cit.). In 1955 he settled in the neighbourhood of the Jardin du Luxembourg, spending each summer in the Berry. Here he found his roots in communion with his forebears: “I feel them alive in me and I feel myself alive in them” (op. cit.). Estève worked on watercolours, drawings and collages, where a change similar to the one which occurred in his paintings is noticeable. “In watercolour, there is the transparency of the colour produced by the water which sometimes allows us to see the paper… and I rework the parts which don’t satisfy me. I work with watercolour in the same way that I work with oil – for long periods” (op. cit.). 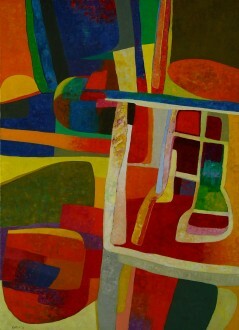 The forms and colours arrange themselves without any apparent intervention from the artist, leaving his role to chance. Fluid colours and strong forms are balanced in perfect chromatic modulation. He makes frequent use of the sponge. Presented in all the solo exhibitions, the watercolours were shown separately in Paris, at the Galerie Villand-Galanis in 1956 (30 watercolours and 20 drawings), 1958 (catalogue with a poem by André Frénaud) and in 1963 (34 watercolours 1960–1962, catalogue, text by G. Borgeaud); then in Cologne at the Galerie Dom (watercolours 1956–1962) in 1963; followed by exhibitions in 1973 in Paris at the Galerie Claude Bernard (42 watercolours 1957–1972) and Zurich (preface Dora Vallier); as well as in 1978 at the Foire Internationale d'Art Contemporain (FIAC) (1952–1974) and in 1986 in Tokyo (1950–1986). For his drawings, after 1941 Estève used charcoal, more appropriate for stumps and rubbing, which allowed him to work with every possible shade of grey and black, sometimes highlighted with yellow and blue. In 1960 the Galerie Villand-Galanis showed 100 drawings done between 1920 and 1954. An album was published with a text by Frank Elgar. In 1972 the Galerie Claude Bernard showed 60 drawings done between 1960 and 1971 (catalogue, text by J. Laurent) and in 1984, 50 charcoals and crayons (1970–1983, text by Y. Peyré). With his use of this technique Estève showed himself to be the heir to Seurat. Finally, he worked with collage, with which he had first experimented in 1950, returning again to this technique in 1956, 1957 and 1964. The two important phases occurred between 1965 and 1968, followed by a new series in 1971 and 1973. In 1969, 69 collages from 1950 to 1968 were shown at the Galerie Nathan, Zurich (text by P. Francastel). As the years went by, Estève’s work grew in grandeur. The rigour of the composition and the robustness of the forms combined with an increasing softness in the use of colour. He stressed the fundamental tones to the extent where it has been said that his palette’s ‘sonority’ permits black and white to act in counterpoint. This saturation of reds, intense blues, greens and yellows induces light, inseparable from form. In endless space, the luminous vibrations provide depth within the two-dimensional work. The vigorous and playful character of Estève’s imagination, inherent in his creative process, is also apparent in his titles, which refer to the painting’s visual character. There were few solo exhibitions besides those already mentioned: 1954 Lille, Galerie Henri Dupont (11 paintings, 15 watercolours) and again in 1957 (6 paintings, watercolours and drawings); his first exhibition in Paris at the Galerie Galanis in 1955, 30 paintings from 1948 to 1954; this gallery subsequently became the Galerie Villand-Galanis and in 1961 it showed 34 paintings done between 1956 and 1960 (catalogue, text by J.P. Raus). We should mention the exhibitions at the Galerie Benador in Geneva in 1957 (watercolours and drawings, catalogue by J.E. Muller) and in 1960 (27 drawings done between 1926 and 1959). In 1957 Estève made the stained-glass windows for the church of Berlincourt in the Swiss Jura. He also made a number of lithographs: the first of these in colour were published in 1951 at the Clot workshop and others were made in 1954 at the Desjobert workshop, then from 1955 at the Fernand Mourlot workshop. A series made between 1952 and 1969 was shown at Privas in 1971. Finally, he executed tapestry cartoons (the first of these in 1963) woven by Pinton in Felletin. The first retrospective was held in 1961 at the Kunsthalle in Basel (catalogue by A. Rüdlinger and J.E. Muller), then shown at Düsseldorf, Kunsthalle (catalogue by K.H. Hering and J.L. Ferrier), the Copenhagen Museum (catalogue by L. Rostrop Boyesen) and in Oslo at the Kunsternes Hus (catalogue by A.J. Aas and R. Revold). Estève has since regularly exhibited in Paris – showing at the Galerie Claude Bernard since 1972 – and in the French provinces, as well as in Switzerland, Denmark and Luxembourg, and recently in Japan. Among the many group exhibitions we should mention: 1949 La Nouvelle Peinture française, Musée du Luxembourg. 1950 Le cabinet d’un amateur d’aujourd’hui, Galerie de France, Paris; Galerie Denise René Quelques aspects de l’art d’aujourd’hui and again in 1951 and 1953. 1951 École de Paris 1900–1950, Royal Academy, London; Parisian painters of the second generation, Kunsthalle, Basel. 1952 Painters of the École de Paris, Edinburgh Arts Council: Current trends of the École de Paris, Basel, Kunsthalle, text by Charles Estienne; La Nouvelle École de Paris, Galerie de Babylone, Paris, organised by Charles Estienne. 1954 Current trends of French art, Ostend, Kursaal; Aspects of contemporary French Painting, Parsons Gallery, London. 1955 Painters of today, Turin. 1957 Beaudin, Estève, Tal Coat, Milan, Centre français; Pérennité de l’art français, Geneva, Musée de l’Athénée. 1959 Peintres d’aujourd’hui. Musée Grenoble. 1964 Survey of international painting since 1950, Kunsthalle, Basel, text by A. Rüdlinger. Estève participated in the Salon de Mai in 1950 to 1952 with Paris a 2000 ans, and in 1953, 1954 and 1955 with Jazz équestre. Venice Biennial 1954. Dokumenta II Kassel 1959. Invited to take part in l’École de Paris Galerie Charpentier, from 1954 to 1958 and in 1960. 1970 awarded the Grand Prix National des Arts. 1981 Rétrospective 1950–1980, Musée Cantini Marseille, Musée du Luxembourg and Musée de Metz. Catalogue, text by M. Le Bot. 1983 Proposition pour une rétrospective Maison de la Culture, Bourges and Musée Bertrand, Châteauroux. Catalogue, text by Dora Vallier. 1986 Rétrospective, Paris, Grand Palais. Catalogue by Jean Leymarie with a text by Yves Peyré A la pointe extrême de la durée. Complete bibliography. Then shown in Oslo and Tübingen. Recent exhibitions Galerie Tendances in Paris in 1985, 1986, 1988 (text by Robert Marteau) and 1989. Catalogues. 1990 Estève, peintures récentes. Galerie Carré, Paris. Catalogue, text by François Chapon. In 1982 Estève wished to donate a large number of works and an association was created. The donation was accepted in 1985 by the City of Bourges, which shows the works in the Hôtel des Echevins. The Musée Estève was inaugurated in autumn 1987. Catalogue. A large number of works by Estève are held in museum collections including Paris: Musée National d’Art Moderne, Centre Georges Pompidou, Petit Palais – Lille – Châteauroux – Colmar – Dunkerque – Grenoble – Le Havre – Marseille – Metz – Stockholm – Göteborg – Lausanne – Pittsburgh – Brussels – Luxemburg – New York – London – Copenhagen – Liège – Oslo – Ottawa – Sydney. Francastel: Estève, Galanis, Paris, 1956. E. Muller: Estève. Hazan, Peintres d’aujourd’hui, Paris, 1961. Dora Vallier: Estève et le dessin. Nouvelle Revue Française (NRF) Paris, July 1972. Hommage à Estève, XXe siècle, special edition, Paris, 1975. Monique Prudhomme, Estève, Hans Mœstrup. Catalogue of Estève’s prints (introduction by Dora Vallier), Forgalet Cordelia, Copenhagen, 1986. Monique Prudhomme-Estève: Estève. Catalogue Musée Estève. Donation by Monique and Maurice Estève to the City of Bourges. 1990. Complete bibliography.